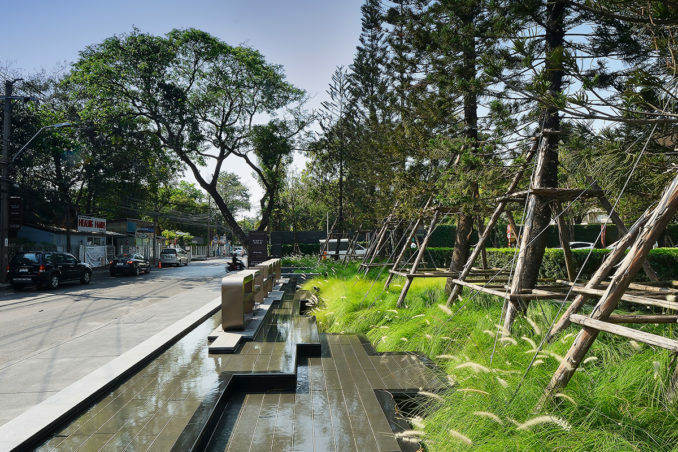 The site is situated amongst a tranquil neighborhood of high-end residential area of Bangkok. 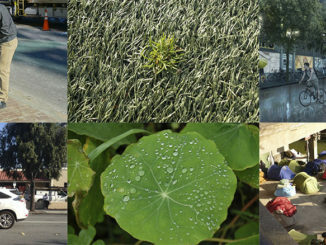 The neighborhood is the low density private housing with garden spaces. Introduction of this high density development in the area is quite a sensitive issue for the neighbor. 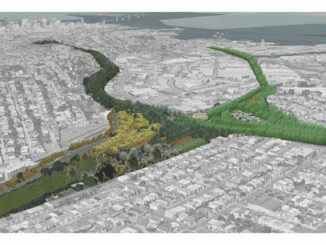 “Integration” is the design strategy that aims to create the project that can be well integrated with the neighbor context visually and socially. 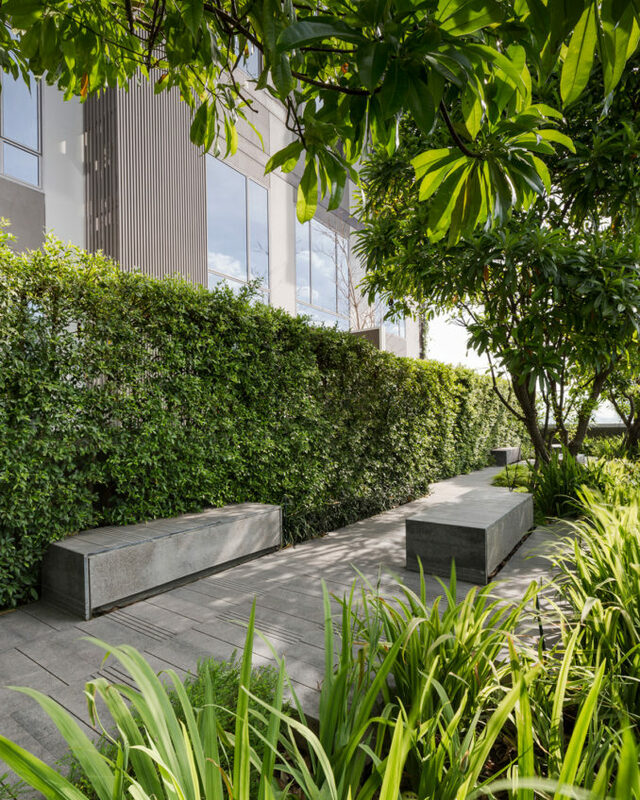 At ground floor, boundary between public and private space is blurred, typical high solid wall at the frontage is replaced by a more welcoming garden space that comprises of low cascading water feature under pine grove with wild grass. 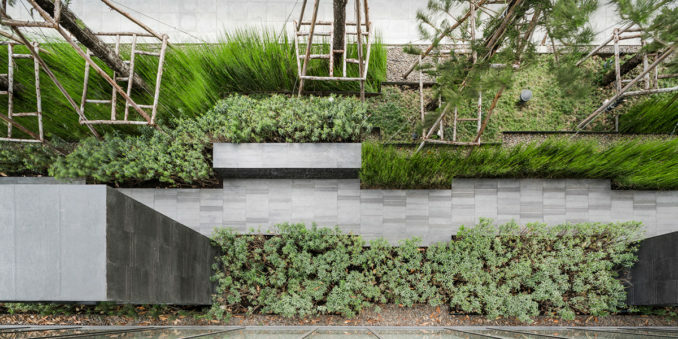 This frontage garden with mountainous planting species in urban context then becomes the project statement which draws public attention. The site is situated at the Sukhumvit neighbourhood – the area well known for highrise residential development. As city is getting denser and denser, typical urban condominium like Morph doesn’t leave much space for garden on ground floor. 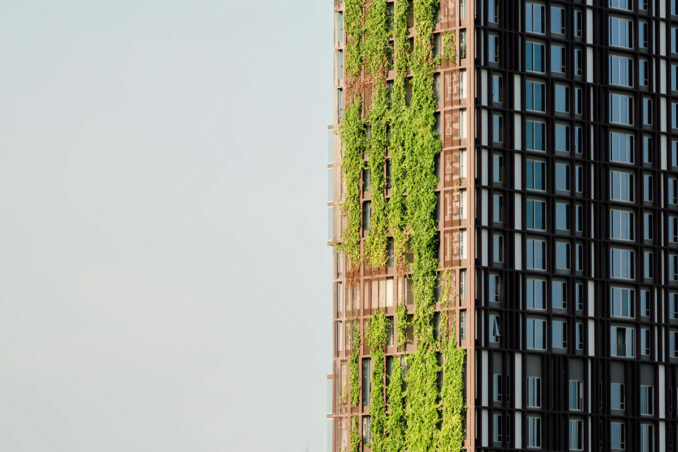 Therefore, our proposal aims to increase green surface not only on ground floor but also along the 32 storey high building façade as green wall and sky garden. Careful planter/irrigation detailing and mock-up test on the actual facing of green façade is crucial to make sure that the vertical greenery is sustainable. The project comprised of two residential buildings; A and B. There are public functions such as café and sale gallery located on the ground floor of these two buildings. 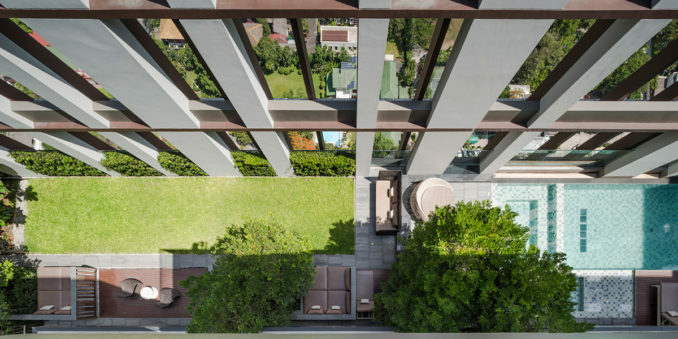 There is a main path that is not only acting as main circulation connecting people from main entrance to these two residential towers but also acting as a social corridor for the residents and visitors. Pavilions and seat walls are located along the main path under the pine groove as social node. 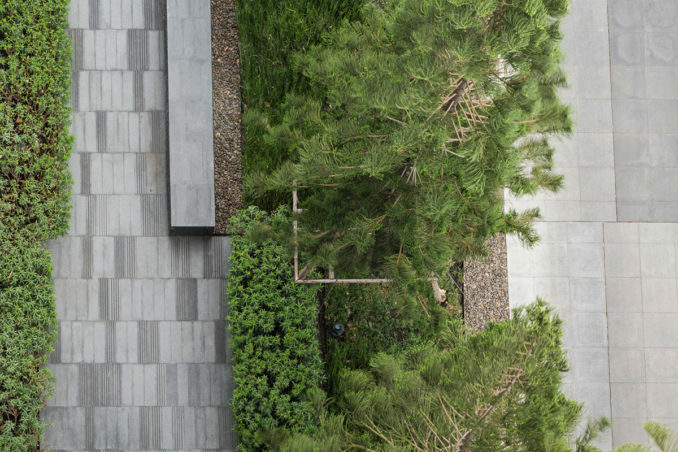 Combination of intricate hardscape material and planting species is well articulated to achieve calm and tranquil space for this high-end residential. 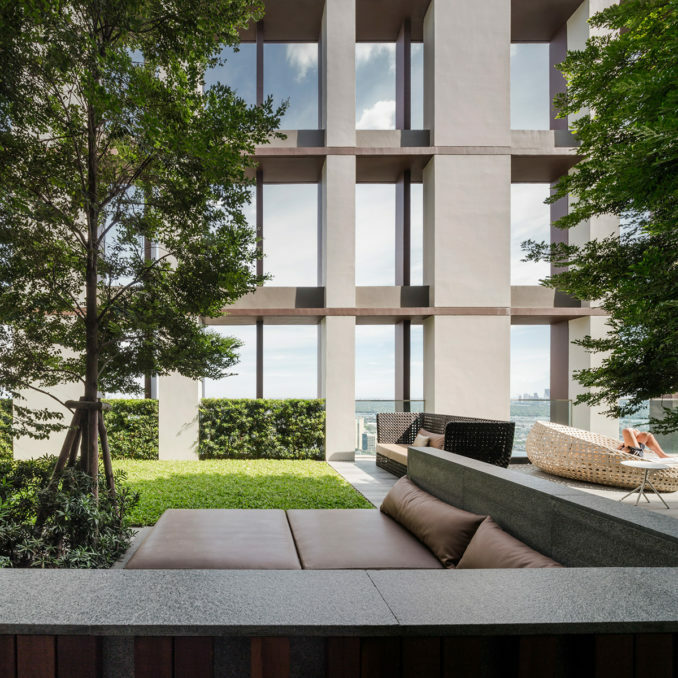 As a concept led by the architect, there are various spaces on the buildings dedicated for sky gardens as social space for residents. 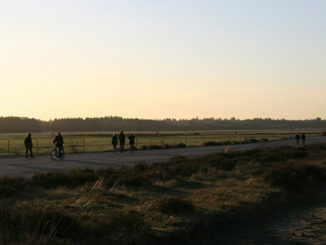 Wind tolerate tropical planting species are introduced to these “sky oasis” to respond with windy condition at higher levels. Moreover, two sides of building façade facing east and west are covered with green climber. 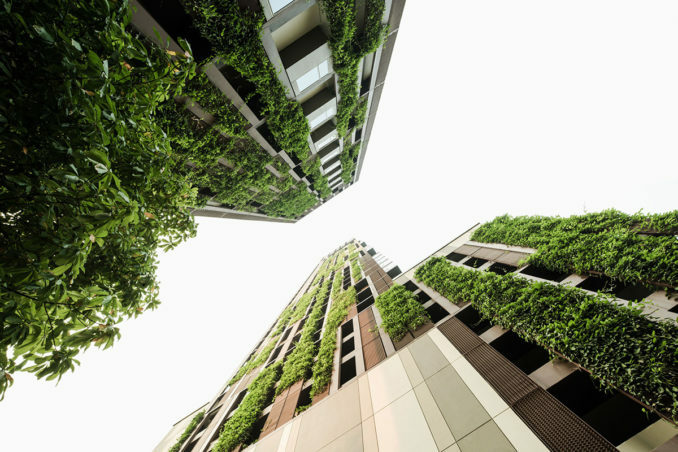 These green façade is not only help to mitigate the heat from penetrating into the building but also help to minimize glaring impact to surrounding neighbor and overall environment. The suitable climber species that can tolerate windy condition, fast growing and easily to maintain are introduced. There are planters provided at every floor with 600 mm soil depth. It has to be equipped with auto irrigation system, accessible service corridor and good drainage system so that it can be sustained and maintained in the long term. Site Area | 2336.13 sq. m.